Sled Island Film Announces Its Curators, an Intern Position and Upcoming Fundraiser! Sled Island has exciting news for our 2013 film program including Canadian guest curators Alexander Carson and Kyle Thomas, a Student Intern Job Posting for our 2013 Programming Assistant, and an upcoming fundraiser! 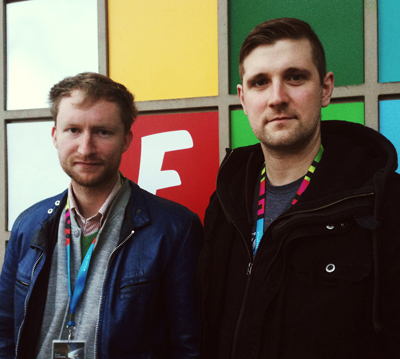 Sled Island is pleased to announce two Canadian film curators for our 2013 program; Canadian filmmakers Alexander Carson and Kyle Thomas are excited to be joining Sled Island 2013 as guest curators of the festival's film program. Carson and Thomas are founding members of the Calgary-based media arts collective North Country Cinema, an organization dedicated to the production and distribution of innovative film and video content. In 2012, they presented new work in Cannes, SXSW, and dozens of other festivals across Canada, the United States, and Europe. For Sled Island 2013, Carson and Thomas will curate a program of short films that reflects their commitment to intimate storytelling and gritty personal narratives by bringing the best work from major international festivals to Sled Island. Job Posting: Film Programming Assistant. Sled Island Music and Arts Festival is seeking a Student Intern for the position of Film Programming Assistant to support in the coordination and promotion the 2013 film program. This is a fantastic opportunity to gain applicable skills and mentored experience in programming and coordinating film events and working in a festival environment. The successful applicant will have a strong interest in film and be willing to work in a team environment; prior experience in organizing events is welcome. This is a 4 month part-time internship. Interested candidates must apply through the SCIP website—Apply now! The Sled Island film program is having a Fundraising Cabaret in March featuring film and music! Stay tuned for more details after our first wave of headliner announcements on March 5, 2013!! 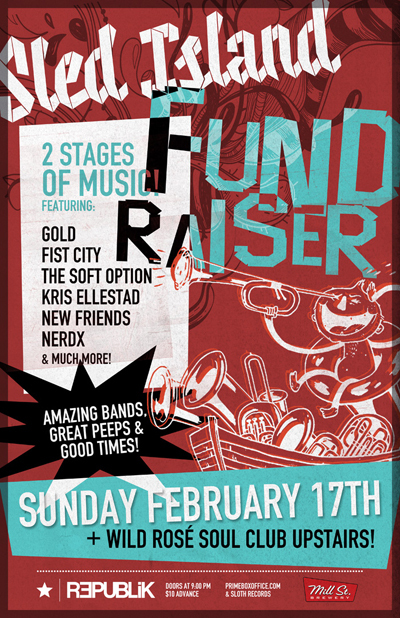 Sled Island is gonna' raise some funds while raisin' some fun at this Sunday's fundraiser! We're just weeks away from announcing our first run of artists for the 2013 festival (hint, they rule!) and we thought we might as well get the Palgary party going this week. $10 gets you two stages and multiple floors of incredible bands, awesome DJs, great peeps and good times. Guaranteed. Stamped, no erasies. Swoonable spacey dream pop like whoa! It's hard not to picture Gold as something of a Calgary supergroup considering the pedigree of Kaelen Ohm (Shrapnelles), Rena Kozak (Shematomas), Matthew Swann (Extra Happy Ghost, Astral Swans) and Chris Dadge (literally every other Calgary band?). One of the festival's favourites! The talk of the town following their absolutely mind-melting, knee-buckling set at the mini SoundOff festival this past weekend. A dizzying concoction of reverb-drenched surf guitar, garage rock frenzy and angular post-punk. Fronted by one of Calgary's greatest frontmen, Chris Zajko (Sharp Ends, The Ostrich), The Soft Option are a walking lesson in garage-y rock n' roll done right. Hooks, musical detours and incontestable stage presence. We've said it before and we'll say it again - "Losing Streak" might be the best single recorded by a Calgary band in decades! Until you've seen him live, it's hard to fully comprehend the seemingly effortless and devastating delivery of expert folk songcraft of Kris Ellestad. While his performances have become increasingly rare in Calgary over the years, they have also become increasingly vital. This is confident music. NerdX used to be a Calgary staple at all-ages shows held at the Carpenter's Union Hall, melting minds with his unique delivery of some of the most inspired (and admittedly nerdy) rap tunes to hit Canada. When the Hall stopped housing shows, NerdX seemed to go into hiding, increasing his legend through whispers and rumours. Sled Island is proud to announce that he's back and he's armed with some deeply personal and off-the-wall new tunes to go along with the classics. A super rare club performance by the much buzzed-about Calgary band. New Friends brings together dissonant noise, effortless, long-winded guitar melodies, hard hitting drums and stunningly beautiful vocals. The songs performed by this band were crafted over a period of about 10 years in the bedroom of local hearthrob Evan Van Reekum (Fist City), and are now being supplemented by Calgary dreamboat Ryan Von Hagen - and local mega-ultra babe Kaelen Ohm (Gold). You know, just a few New Friends. + Much, much more announced over the coming days! Sled Island Illustration/Graphic Design Request for Proposals + Opportunity! We're on the lookout for talented folks to fill two posts to help the festival out with its graphic design needs. First up, we're looking for an illustrator or designer to create a series of graphic design elements that strengthen the festival's brand, which in the past has included everything from viking bunnies to instrument-fueled airplanes. Are you, or do you know someone who is creative, inspired and able to convey a powerful message in a thoughtful and fun way? Apply now! The Sled Island Music & Arts Festival is seeking an individual to create a portfolio of graphic elements (i.e. illustrations and/or design, collage, photography, etc.) to work with and strengthen the festival’s current branding for the 2013 festival. The selected individual will work in partnership with the festival’s executive director and graphic design firm to complement the existing design elements already in place (logo, colours, layouts and lettering). The illustration and/or graphic design elements will be used in the festival’s print and online marketing campaigns and be featured on sledisland.com. - A list of past clientele. As well, the festival has joined the SCIP (Serving Communities Internship Program) to offer a post-secondary student the chance to join the Sled Island team. We're seeking a creative and dedicated individual for the position of Graphic Design Intern. Working with the festival staff and the design team in place, the Graphic Design Intern will contribute to the production of the marketing campaign with tasks such as: ad design, poster/flyer design, web design and newsletter design. The successful applicant will share the Festival’s passion for presenting emerging music and arts and will be highly creative, self-motivated and with strong communication skills. This is a 5 month part-time internship. Interested candidates must apply through the SCIP website - Apply now! We're thrilled to announce our 2013 guest curators, Sled Island festival alumni, John Dwyer and Tim Hecker! The guest curators work each year to help to set festival's specific tone through programming selections and with their presence at the festival. Dwyer and Hecker join an impressive list of past Sled Island curators which has included Andrew W.K., Danny Vacon (The Dudes), Fucked Up, Colin Newman (Wire), Scott Kannberg (Pavement), Mark Hamilton (Woodpigeon), among others. Festival favourite, John Dwyer, singer and guitarist for the critically-acclaimed San Francisco-based, psych-tinged, Krautrock-inspired garage rockers, Thee Oh Sees, returns as guest curator for Sled Island 2013. The former member of Coachwhips, The Hospitals and Zeigenbock Kopf, has earned his reputation as a wholly engaging live entertainer and as one of the best and most challenging independent songwriters working today. This reputation was cemented with Sled Island festival-goers at Thee Oh Sees still-talked about, jaw-dropping 2011 set. Joining Dwyer is the celebrated and hugely influential Montreal-based electronic artist, Tim Hecker. Oft hailed as one of the most significant ambient musicians since Brian Eno, Hecker has been staggeringly consistent in his recorded and live output under the Jetone moniker, under his own name and through collaborations with Oren Ambarchi, Aidan Baker (Nadja) and Fly Pan Am. Following his superb and powerful Hillhurst United Church set at Sled Island 2012, Hecker will bring his uniquely cerebral and emotive touch to programming as the festival’s first electronic music curator. We're also giddy to welcome TSN's Jay Onrait and Dave Hodge into the festival to host a special Sled Island 2013 concert series! While Onrait and Hodge might not be the first, second (or even hundredth) names to come to mind when thinking about Sled Island, Calgary has a rich history of combining independent music with sport; from local campus radio station CJSW’s long-standing street hockey tournament, Slurpee Cup, to the inception of Dirtbag Baseball, a baseball league composed primarily of Calgary music scene mainstays. Onrait and Hodge, well-loved Canadian sports television personalities, are avid music fans excited to be showcasing their passion for music with a special Sled Island concert series. ...and that's just a peek at how 2013 is shaping up. Like where it's going? Why not pick up a Sled Island pass while you're here? Check back in in a month to see our first wave of bookings get announced (hint: it's gonna' be a good year).